In a bold move (critics would say an "about-face," but it's not really), US President George W. Bush outlined his plan for reducing global carbon emissions. He urged 15 major countries to agree by the end of next year on a global emissions goal for reducing greenhouse gases. He wants a series of meetings to begin this fall and to include countries such as China and India, as well as major European nations and the United States. Some say this is a salvo designed and timed to get ahead of criticism the Bush administration was likely to receive at next week's Group of 8 (G8) Summit in Germany. Climate change is to be a leading topic on the agenda there. But President Bush said, in announcing his plan, "The new initiative I'm outlining today will contribute to the important dialogue that will take place in Germany next week." UK Prime Minister Tony Blair applauded President Bush's announcement on climate change as "a huge step forward," saying also that the true "significance of this is America accepting this is a real problem now, accepting it's got to offer real leadership on this issue and being prepared to be part of a global deal at the heart of which will be the reduction of emissions." Environmentalists from World Wildlife Fund and liberal advocacy group Center for American Progress attacked Bush for "trying to leapfrog next week's summit" and push "aiming for 2008." In an extreme reaction, one critic claimed it was "morally unacceptable" for Bush to preempt the G8. But according to people familiar with the situation, Bush has had not so much a conversion on the issue of climate change as his thinking has evolved. Bush himself said today in his remarks that "science has deepened our understanding of climate change and opened new possibilities for confronting it." He went on to suggest that "the United States will work with other nations to establish a new framework on greenhouse gas emissions for when the Kyoto Protocol expires in 2012." Let's hope the critics are wrong on this one and that the G8 meeting will be a productive next step, following on the heals of the President's proposal. From the BBC Wednesday: HSBC is setting aside $100m (£50m) for an initiative to tackle climate change. The funding by the UK's largest bank will help charities and environmental groups to research some of the global causes and effects of climate change. The partnership will look at ways to protect the world's most important rivers and identify how cities can respond to environmental threats. HSBC also said it would create "a green taskforce", to ensure climate awareness was central to its own business. HSBC is the latest UK company to pledge changes to the way it operates in the face of calls for big business to do more to prioritise environmental concerns. "We believe we can tackle the causes and impacts of climate change," said HSBC chairman Stephen Green. HSBC, which will spend $5m of the $100m on managing the project, said it would enable the four bodies to expand their climate-related research and undertake work in new countries such as China and India. In May 2007, nature.com is launching a news website dedicated to providing thorough investigative reporting on global climate change. 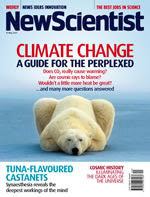 Nature Reports: Climate Change will be a one stop-shop for in-depth news, features, opinions, commentary and analysis. As the latest addition to the Nature Reports series (which includes Avian Flu and Stem Cells), Nature Reports: Climate Change will explore 'the news behind the science and the science behind the news' of important areas of scientific research. This resource hub on global warming will cover the science of climate change through reviews, research highlights and features, as well as casting a wider net to cover the larger implications of climate change for policy, society, and the economy. A key feature will be its interaction with the wider community, initiating dialogue, debate and discussion through regular blogs and podcasts. Here, are links to nature.com's existing resources on climate change: news@nature.com's climate change in focus, Nature's web focuses on climate change topics, and news@nature.com's special on regional climate change. "First, the US must engage in an energy efficiency programme that takes effect without delay and has meaningful bite. As long as developing countries can point to the US as a free rider there will not be serious dialogue about what they are willing to do. I prefer carbon and/or gasoline tax measures to permit systems or heavy regulatory approaches because the latter are more likely to be economically inefficient and to be regressive. The key point is that after Kyoto, where there was US vision in setting goals but no on-the-ground action, there must be real policy commitments. "Second, the major industrial countries should commit to a very large increase in funding for research in technologies that offer the prospect of reducing the concentration of greenhouse gases, such as renewable energy, carbon sequestration and energy efficient engines. They should also learn a lesson from the pharmaceutical experience and commit to making intellectual property relating to clean energy available to developing countries on preferential terms. It may be that ambitious emissions- reduction targets can be achieved with existing technology, yet new technologies could help. "Third, the World Bank, and probably the regional development banks, should be reconstituted by their shareholders as “Banks for Development and the Global Environment” and take on as a major mission the provision of subsidised capital for projects that have environmental benefits that go beyond national borders. There is much that can be done to encourage energy efficiency in almost every sector within developing countries, yet national governments have inadequate incentives to take account of global impacts. Moreover, the institutions need a new role with respect to countries other than the poorest ones at a time when the leading developing countries are actually exporting rather than importing capital. "Fourth, a goal should be set of eliminating by 2025 the more than $200bn the world spends each year on energy subsidies, and enforced through strategies such as those used for inappropriate subsidies in trade. This is a clear case where environmental and economic imperatives coincide and it is one where external political commitment is likely to be desirable in many countries, just as in the trade area. This will require considerable work on the definition of and measurement of total energy subsidies. Such work will lay a foundation for the more ambitious efforts that may be needed in harmonising world energy prices above market levels in the future. "There is a final critical process element in the policy response. Given that viable solutions depend on significant changes in developing country policies and that these countries are unlikely to make them unless they see their own interests as at stake, it is essential that they be full participants in setting the global direction. They are surely likely to do more if they can help shape policy than if it is simply the Group of Seven leading industrialised nations seeking to bring them along." We like this kind of thinking at The Green Skeptic. Angela MacDonald-Smith of Bloomberg News reports that Russell Caplan, chairman of Royal Dutch Shell in Australia called for global carbon trading to set a price on carbon and allow for investments in new energy-supply projects while reducing emissions. According to the article, which appeared in yesterday's International Herald Tribune, Caplan said Monday at the Asia-Pacific Economic Cooperation energy business forum in Darwin, "that while the European Union's carbon trading system is 'a good start,' a worldwide plan is required." "'Market mechanisms are likely to be the most effective means of implementing change,' Caplan said at the forum. 'Trading needs to become global to become truly effective and establish a clear market price for CO2 that will be factored into the investment evaluations of the new technologies and energy conservation measures that we need for a low-carbon future.'" Global Climate Change: Going to H-E-Double Hockey Sticks? Stefan Rahmstorf of RealClimate posted this morning about the notorious millennial temperature curve, stating that new IPCC report compiles a dozen reconstructions for the temperature of the Northern Hemisphere, confirming that Northern Hemisphere temperatures are now higher than at any time during the past 1,000 years (see above image) and strengthening the conclusions drawn in the previous IPCC report of 2001. This despite opinions to the contrary such as those in the Wall Street Journal. The authors also note that climate skeptics have long cited a graph from the 1990 IPCC report that was meant to illustrate an estimate for central England, but was not identified as such in the report. See also RealClimate's "Dummies Guide to the Hockey Stick." General Electric Co. Chairman and Chief Executive Jeffrey Immelt said his "green" ecomagination unit was gaining steam and it launched 11 new products and services Thursday, including a hybrid locomotive and a carbon offset company. Arguing that "green is green" -- environmental technology can generate serious money for GE -- Immelt said demand for green products and services exceeded expectations as awareness about global warming and energy conservation snowballed. "Green is now becoming pervasive. It is becoming universal," Immelt said at a event at his group's Universal Studios. "Work on energy efficiency, working on emissions reductions, conservation, clean water is simply good business. In our case, it has always been about growing the company." Ecomagination has backlog of orders worth over US$50 billion and chalked up US$12 billion in sales last year. Despite the expanding market, Immelt has stuck with his sales target of US$20 billion in 2010. "We are on our way to US$20 billion and I am convinced we can exceed that number and expand as time goes on," he said. Among the ventures launched Thursday was the carbon emissions offset partnership with energy company AES Corp. to produce offsets for 10 million metric tons of greenhouse gases a year by 2010. With Union Pacific, GE unveiled hybrid locomotive that recycles energy and stores in in on-board batteries. In the automotive sector, GE has also invested in the battery company, A123, which is working on the next generation of battery technology for hybrid and plug-in hubrid electric vehicles. Wal-Mart Stores Inc., which says it is the largest private consumer of electricity in the world, has announced that more than 500 stores will use GE light emitting diodes (LEDs) to slash energy consumption in its refrigerated display cases. And oil company BP Plc said it is forming a global alliance with GE to develop 10 to 15 hydrogen power projects that will cut greenhouse gas emissions from electricity generation. "This is no longer a fringe topic. This is a niche topic. This is a mainstream topic that is being driven across the broad economy," Immelt added. RealClimate describes itself as "a commentary site on climate science by working climate scientists for the interested public and journalists. We aim to provide a quick response to developing stories and provide the context sometimes missing in mainstream commentary. The discussion here is restricted to scientific topics and will not get involved in any political or economic implications of the science." Contributors include NASA climate modeler Gavin Schmidt and Michael "Hockey Stick" Mann, along with a half-dozen or so others of some renown. The compendium is divided into sections from noobs and neophytes to those who consider themselves "informed, but in need of serious discussion of common contrarian talking points." Bookmark this very useful post. Nothing says New York like a Yellow Cab, but soon the yellow cabs will turn green under a plan unveiled by NYC Mayor Michael Bllomberg yesterday. Bloomberg plans to put 1,000 hybrid taxis on NYC streets by the fall of 2008 and replace the remaining 13,000 taxi fleet with hybrids by 2012. Bloomberg estimates the plan will save cab drivers more than $10,000 a year in gas and other expenses. The Big Apple is turning green. Environmental Movement: Is the Pew/NET M&A the Wave of Future? Last week, the Pew Charitable Trusts' environment program (Pew) and the National Environmental Trust (NET) announced it was merging to form a new entity, the Pew Environmental Group. While the Washington Post wrote about the merger a week ago, I haven't heard much about it from colleagues in the field. I'm surprised. As Post staff writer Juliet Eilperin writes, many "Americans think of the environmental community as a fractious bunch of free thinkers, that if you put two of them together they would generate at least three different opinions." We've been hearing for years from the foundation community that they want environmental groups to collaborate more. Sometimes this works and scales of efficiency and effectiveness are achieved that would otherwise be impossible; most of the time, however, such direction leads to a scramble to create new projects or programs that end up making more work for all concerned. True, there are some genuine collaborations that have worked. Most of these have been at the field level, although there are periodic efforts to get the green groups to work together or to share best practices at the highest level. Still, there is room for improvement on that front as scarce resources generate turf wars as very distinct, often niche missions compete for a limited donor pool. We're hearing it from donors too. Questions about what distinguishes one group's strengths from another, missions that are beginning to overlap more frequently, and even long-range goals that are duplicated and would be more complementary if we would only take Rodney King's advice and "just get along." But this merger idea is a novel one. It happens in the for-profit sector all the time and it is surprising that it hasn't happened before in the civil sector. And why not? This bold move by Pew and NET is forward thinking. Both parties acknowledge that they will be stronger as one. As Environmental Trust President Philip Clapp told the Post, "The challenges are so enormous and we have such a short window of time to solve the problem, we decided we had to change the way we operate." In the business world, mergers are often a way to expand operations and, sometimes, to bring in expertise and capacity that is otherwise lacking. If done right, it may also allow for greater efficiencies, long-term stability or sustainability. Will this move spur a wave of M&A activity in the environmental movement? Keep an eye on the landscape: This may be an idea whose time has come. Seth Godin has a post this morning about the marketing behind global warming and reducing carbon emissions. We've had a dialogue on the subject before (see Global Warming & Other Misnomers...) and our opinion hasn't wavered. "'Fight global warming' is a fine slogan," Seth writes. "Except it's meaningless. That's like dieters everywhere shouting, 'eat less' while they stand in line to get bleu cheese dressing from the salad bar." I tend to agree with Seth on the point that we will always struggle if we try to convince Americans (and those who desire an American lifestyle) to do with less ("Reduce, Reuse, Recycle") or to limit themsleves. We just don't have such restraint. And, as I've argued before here, it's not about limiting growth, but encouraging a better kind of growth. We crave more. That's why hotels are in competition now to see who can offer you the most free food: Hot all-you-can-eat breakfasts, free cookies with check-in, how about "lunch on us?" Even fast food chicken chain Chik-fil-a doesn't feature chickens telling you to eat less beef; they have cows exhorting you to "Eat More Chicken!" So, if Americans crave more and environmentalists continue to ask us to want less and use less, what's the disconnect there? Everyone knows how hard it is to get people to change their lifestyle. How do we expect to be successful getting the herd to reduce its carbon footprint when its been supersized? Better, Seth argues, to make it about doing MORE. "Let's figure out how to turn this into a battle to do more, not less," he writes, suggesting we "require all new cars to have, right next to the speedometer, a mileage meter. And put the same number on an LCD display on the rear bumper. Once there's an arms race to see who can have the highest number, we're on the right track." Let's make this a campaign about more and maybe we'll get somewhere. Global Climate Change: Who Built the Ark? Greenpeace. This is kind of amazing, actually. I'm not usually a fan of Greenpeace's stunts, but this one is really clever. AP reported yesterday that Greenpeace activists plan to build a replica of Noah's Ark on Mount Ararat, in what is now modern Turkey, where the Biblical vessel was said to have landed after the great flood (or the first mass near-exinction, if you want to call it that). It's a clever appeal for action on global warming. Turkish and German volunteer carpenters are building the wooden ship on the mountain in eastern Turkey, bordering Iran. The ark will be revealed in a ceremony on May 31, a day after Greenpeace activists climb the mountain and call on world leaders to take action to tackle climate change. For years when I lived in New York City, I often marvelled at the fact that my apartment and office windows had to be opened all winter long. It was just too damned hot in the buildings and the heat couldn't be regulated (at least not by tenants) to maintain a comfortable level. It's been over a decade since I lived in the city, but when I was there for a climate change meeting in February, I found that not much had changed. The heat was oppressive in the conference room where we sat in a Midtown office building. First one participant opened a window, then another, and another. I don't think any of us thought about the irony of what we were doing. But after the meeting, I kept thinking, how much energy was being wasted all over the city? It must be staggering if you calculate offices and housing stock in Manhattan alone. What would it take to retrofit a city like New York? Now former president Bill Clinton is proposing to answer that question. Yesterday, Clinton announced the creation of a global energy efficiency building retrofit program, bringing together four of the world’s largest energy service companies, five of the world’s largest banks, and fifteen of the world’s largest cities in a landmark program designed to reduce energy consumption in existing buildings. "Climate change is a global problem that requires local action," said President Clinton in a press release. "The businesses, banks and cities partnering with my foundation are addressing the issue of global warming because it's the right thing to do, but also because it's good for their bottom line. They're going to save money, make money, create jobs and have a tremendous collective impact on climate change all at once." According to the press release generated by the Clinton Foundation, "Urban areas are responsible for approximately 75 percent of all energy use and greenhouse gas emissions in the world. Buildings account for nearly 40 percent of global greenhouse gas emissions, and in cities such as New York and London this figure is close to 70 percent." Under the Clinton program cities and their private building owners access to the necessary funds to retrofit existing buildings with more energy efficient products, typically leading to energy savings between 20 to 50 percent. According to the Clinton Foundation, companies Honeywell, Johnson Controls, Inc, Siemens and Trane will conduct energy audits, perform building retrofits, and guarantee the energy savings of the retrofit projects. ABN AMRO, Citi, Deutsche Bank, JPMorgan Chase, and UBS have committed to arrange $1 billion each to finance cities and private building owners to undertake these retrofits at no net cost, doubling the global market for energy retrofit in buildings. These banks will work alongside energy efficiency finance specialist Hannon Armstrong and the Clinton Climate Initiative (CCI) to develop effective mechanisms to deploy this capital globally, reports the release. Cities and building owners will pay back the loans plus interest with the energy savings generated by the reduced energy costs generated by the building retrofits. An initial group of fifteen of the world’s largest cities has agreed to participate in the retrofit program, and offer their municipal buildings for the first round of energy retrofits: Bangkok, Berlin, Chicago, Houston, Johannesburg, Karachi, London, Melbourne, Mexico City, New York, Rome, Sao Paulo, Seoul, Tokyo, and Toronto. As part of the Energy Efficiency Building Retrofit Program, the cities have agreed to make their municipal buildings more energy efficient and provide incentives for private building owners to retrofit their buildings with energy saving technologies. "Mayors are responsible for coming up with pragmatic solutions and implementing them effectively – and this program will allow us to do that," said New York City Mayor Michael R. Bloomberg. "We've laid out an ambitious agenda to reduce our carbon emissions, 80 percent of which come from buildings, while being economically competitive and continuing to grow." Mayor of London Ken Livingstone, Chair of the C40, said, "Fifteen cities have already signed up to take advantage of this initiative and I am confident many more will follow." CCI and its partners will also assist participating cities with their initiation and development of programs to train local workers on the installation and maintenance of energy saving and clean energy products. The U.S. Green Building Council and the American Society of Heating, Refrigerating and Air Conditioning Engineers have agreed to help coordinate these programs. I wonder, was Bill O'Reilly in the room? What about Michael Crichton? Global Climate Change: Will They Say, "I Told You So"? With all the buzz about companies like Yahoo!, Citigroup, IBM and even Rupert Murdoch's News Corp. jumping on the bandwagon in support of tackling climate change, it seems we may just be able to make a dent in the inevitable. And this week, Bill Clinton and New York City Mayor Michael Bloomberg convene a group of the world's mayors and governors to swap ideas about how to address climate change. The gathering, known as the C40 Large Cities Climate Summit, is the second of its kind; the first, held in London in 2005, brough together reps from 18 cities. As many as 30 will gather in New York this week. A question occured to me while working in my garden yesterday afternoon: if we succeed in addressing the most egregious effects of climate change, will today's naysayers say, "See, we told you global warming was a hoax. They said the sky was falling and it didn't..."? And who cares if they do? The latest report issued last week by the UN International Panel on Climate Change (IPCC), a group of climate science experts, outlines the best ways to mitigate climate change. Their conclusion? We have what it takes to mitigate climate change and minimize the costs. Working Group III's Report "Mitigation of Climate Change" (click here for a PDF Summary for Policymakers) is the third segment of the larger IPCC report. The first, released in February, concluded that global warming is almost certainly human-caused and the second, which came out in April, warned of the consequences already occurring and yet to come such as massive human death and disease, droughts, floods, and storms. The new report proposes limiting concentrations of greenhouse gases, currently factored at 380 parts per million (ppm) to between 445 and 650 ppm. More importantly, however, the report indicates a variety of mitigation strategies, including energy efficiency and conservation, reducing deforestation, and investing in solar and other renewables to accelerate the world's response to the changing climate. As many of us have maintained, the report concludes that the costs of tackling climate change now are dwarfed by the potential damages of global warming. There is also some consensus around the idea that investments now may foster economic development through investments in available technologies and other measures. That may be tough for many to swallow, especially those opposed to actions that require such lifestyle changes, carbon taxes, or that strengthen limits to CO2 emissions in order to encourage carbon trading. "There are measures that come currently at an extremely high cost because of the lack of available technology," said James Connaughton, head of the White House Council on Environmental Quality, in response to the report. Connaughton and others are concerned that some scenarios outlined by the IPCC report may bring cuts in world gross domestic product of as much as 3 percent. That, suggests Connaughton, is "something that we probably want to avoid." One scenario would put the stabilization level of greenhouse gases in 2030 between 445 and 535 parts per million. This scenario estimates that the negative impact on gross domestic product would be less than 3 percent over more than two decades, with an annual impact estimated at less than 0.12 percent. Much depends upon the price of carbon, as the Wall Street Journal reported over the weekend. The IPCC report used a range of between $20US and $100US for every ton of CO2 to analyze its scenarios. Carbon was trading at $25US in Europe under its carbon trading scheme as recently as last week. A McKinsey & Company study from January suggested "that greenhouse gas cuts approximately as stringent as those surveyed in the UN study would cost as much as $40US a ton of avoided CO2." Whatever the costs, two questions remain: Will we make the necessary adjustments to reduce emissions now and possibly reap the benefits of a new economy? And will we make the necessary lifestyle changes to make a difference quickly and efficiently? For now, the IPCC report suggests we have the know-how and can make it work economically. What remains is the will to change for the sake of a future, especially a future that remains uncertain. My Wall Street Journal didn't get delivered this Monday morning (I hate when that happens! ), so I turned to Real Climate's Week in Review to find some interesting analysis on climate change and global warming news from last week, including a scathing critique of Alexander Cockburn's screed for Counterpunch disputing any connection between CO2 emissions and rising CO2 concentrations in the atmosphere. Worth a read: Real Climate. Pardon me while I catch up on a few things that I missed while I was traveling last week. I reported last month on the Youth Venture/Staples "That Was Easy" Competition, co-sponsored by Changemakers and Staples. Changemakers recently announced the Grand Prize Winner, as well as several finalists. Youth Together, a volunteer youth service organization is the competition's Grand Prize Winner. Youth Together's goal is to engage young people in community service to help abused, homeless and ill children. Youth Together is a 501c3 non-profit organization that works with elementary and middle school student councils, Students Thinking of People and Peer Assistance and Leadership programs to help homeless, abused, and critically ill children as well as homeless animals and the Dallas Zoo. The "That Was Easy" Competition: Showcasing Youth Ventures that are using skills and passions to create a positive impact in society. The prizes include a $1,000 grant for the winning venture, special celebration, and consulting opportunity at Staples Headquarters, and $5,000 Staples shopping spree. The Guardian (UK) reported yesterday that the global market in carbon trading tripled last year to $30bn (£15bn), but quoted the World Bank, which cautioned that the market's "role in the battle against climate change could be hit by worries about the effectiveness of unregulated carbon offset projects." The bulk of carbon trading, some $25bn, was carried out through the sale of allowances under the European Union's emissions trading scheme, according to the World Bank's seventh annual carbon market intelligence report, which was published this week. “These numbers are relevant because they demonstrate that the carbon market has become a valuable catalyst for leveraging substantial financial flows for clean energy in developing countries,” said Warren Evans, World Bank Director of Environment, in a press release. The EU scheme has been criticized for being weak on allowances under the initial phase, which created little incentive to cut emissions and, subsequently, precipitated a fall in the price of carbon. Sources familiar with the situation indicate that allowances have been toughened up for the second phase, which will begin in 2008 and be in force until 2012. The tougher standards may address the fact that polluters have been less obliged to trade. The weaker standards have also given detractors of cap-and-trade schemes fodder for arguing that carbon trading "doesn't work." According to the Guardian article, officially-backed carbon offset projects, subject to the Kyoto agreement, wherein companies and countries invest in emissions reduction schemes in developing countries and emerging markets, doubled to $5bn over the same period and, the bank estimates, "carbon purchases have raised $14bn in 'associated investments' supporting clean energy in developing countries since 2002." We've argued before on this blog that an overarching set of standards is needed to reduce reputational risk and so that both regulated and voluntary schemes can be judged comparatively. The World Bank study seems to corroborate this view. Yvo de Boer, the head of the UN Climate Change secretariat, told The Guardian (UK) that "the official clean development programme (CDM) was working well but some analysis of the scheme was failing to differentiate between the highly regulated CDM and a growing number of unregulated or self regulated enterprises. 'Some confusion can be expected, but some analysis of the CDM has dangerously missed the mark,'" De Boer said. To access the World Bank report, see the bank's Carbon Finance Unit's website. Andrew Revkin reports in today's New York Times. "The world needs to divert substantially from today's main energy sources within a few decades to limit centuries of rising temperatures and seas driven by the buildup of heat-trapping emissions in the air, the top body studying climate change has concluded. "In an all-night session capping four days of talks in Bangkok, economists, scientists and government officials from more than 100 countries agreed early Friday on the last sections of a report outlining ways to limit such emissions, led by carbon dioxide, an unavoidable byproduct of burning coal and oil. "The final report, from the Intergovernmental Panel on Climate Change, said prompt slowing of emissions could set the stage later in the century for stabilization of the concentration of carbon dioxide, which, at 380 parts per million now, has risen more than a third since the start of the industrial revolution and could easily double from the preindustrial level within decades." Planet Ark/Reuters reports this morning that a Boston-based group, KLD Research & Analytics, has licensed an index that allows investors to "bet" on companies taking steps to combat global warming. It's an interesting development for investors looking to make a play in sectors that are tackling this issue. KLD says its Global Climate 100 Index holds small to large-cap companies whose activities reduce the social and economic consequences of climate change. The weighted index holds 100 companies ranging from the energy and utility sectors to industrials and consumer products. Some of the companies invest in efficiency and buy power from renewable sources. That differentiates the index from pure-play renewable energy investment products, KLD spokesman Chris McKnett said. "We are trying to provide investors exposure to the global climate solutions value chain. The sources of climate change are dispersed across the economy and our view is that sustainable solutions also have to be dispersed across the economy," he said in telephone interview. Last quarter the index achieved a return of 5.87 percent and annualized returns since the index's inception in the summer of 2005 were 22.38 percent, KLD said. Among companies the index holds are Whole Foods Market, Inc., which purchases renewable energy credits to offset 100 percent of its electricity needs in North America, and Itron, Inc., which manages the delivery and use of energy and water to increase efficiency. It also holds Japanese company Sekisui Chemical Co. , which has built homes that operate on solar energy since 1998. KLD licensed the index with Fixed Income Securities, L.P.